Many students frequent spaces in Van Wylen to complete the work they’ve been assigned in class, but did you know that there is also space available to teach class in the library? 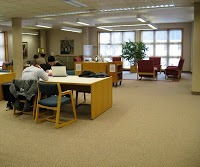 The Library Teaching Lab (LTL), TechLab, Granberg Room, and even the north end of the first floor can be reserved for class. One professor that has used space in the library for teaching class is Susan Cherup of the Education department. 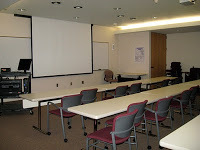 Professor Cherup has used the LTL, TechLab, Granberg Room, Curriculum Library, and the second floor group area for her Exceptional Child, Classroom and Behavior Management, and Computers and Technology in Special Education classes. Another professor who likes to use the library is Natalie Dykstra of the English department. Her 300 level English class, English 113 and Intro to Literature all meet in the library at least once a semester. 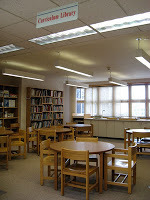 In addition to the more traditional classroom spaces, she regularly uses the north end of the first floor. Dykstra particularly likes to use the library when her students are in the beginning stages of writing papers. They can bring their laptops, talk with one another, and spend the entire class period researching so that when they leave, they have a good amount of information for their projects. Not only do both Cherup and Dykstra enjoy teaching in the library, but both have found that their students seem to enjoy the experience as well.